We know trying to forecast the behaviour of the pair euro/pound is like trying to know where a leave will land when it falls from a tree. Everything is pretty chaotic right know, so we don't have good handles to open the prediction door. 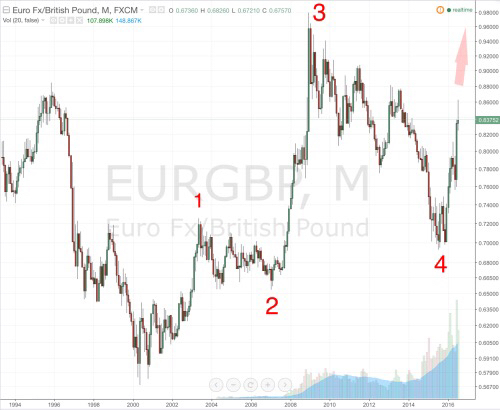 Therefore, we are just going to show you the long-term chart of the EURGBP and imagine that the Elliott Module works and that we are building the last segment (5). The new paradigm these days is not about choosing the best option, but about not choosing the worst one.